Electric car company Tesla has announced its plans to build a massive 10-million square foot battery manufacturing facility. The company expects the new Gigafactory to bring the cost of lithium-ion based batteries down due to the large scale of the operation and its expertise in the field. The same tech that goes into making batteries for electric cars like those from Tesla is used in most of the mobile devices we use today. If Tesla manages to produce an operation on the scale its describing, the company could find itself producing batteries for more than just cars. According to Tesla, by 2020 the Gigafactory could "produce more lithium ion batteries annually than were produced worldwide in 2013." Tesla expects that by the end of the first year of manufacturing, the plant could bring the cost per kWh of its battery packs down by more than 30%. Recently, Tesla CEO Elon Musk confirmed that he and Apple were in discussions but would not disclose any details. Rumors surfaced that Apple might be in-line to purchase the electric car company, but that the meetings were more likely to do with implementing iOS software directly into Tesla vehicles. However, in light of the Gigafactory announcement, analysts are suggesting the talks could have been surrounding Apple getting in early on what could be a possible future battery supplier for its flagship devices. Tesla estimates the cost of building the facility at between $4 and $5 billion, of which it's looking to raise around $1.6 billion in debt financing. As we know Apple could easily fork up the entire bill for Tesla, never mind the $1.6 billion in financing. A plant of this nature, on top of Tesla's well known efficiency when it comes to manufacturing, is something that would likely fit in well with the DNA of Apple. Like with many deals of this nature, if Apple were to opt in early on some kind of partnership or investment level, it would potentially give the company very close access to the process, leading to better batteries at a lower cost. Further details on the facility itself are a little thin still. We do know Tesla plans to conduct as much of the battery manufacturing within the factory itself and that it plans to help power the facility with wind and solar energy set-ups. 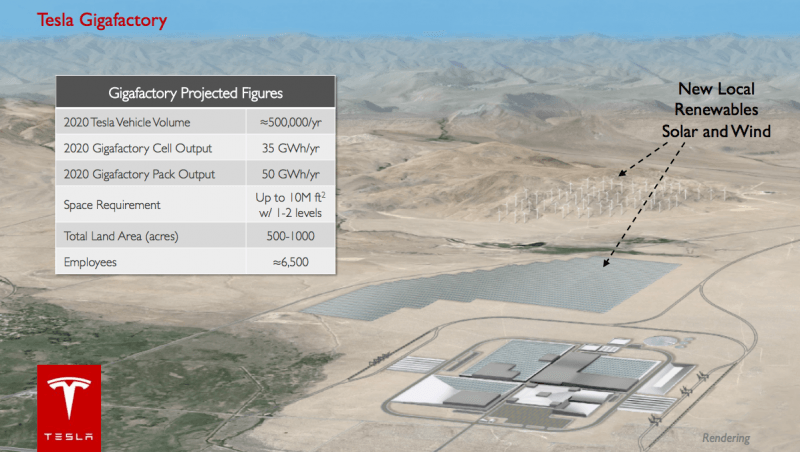 While we are still far enough away that the company is yet to choose on a final location for the Gigafactory, some can say it is clear that it will likely have to manufacture products outside of just its vehicles, especially if sales projections on what will likely be much more affordable Teslas don't quite hit projections.